Blood-Moon Prophecy 4 Israel. Lunar-Eclipse Tetrads on Passover and Tabernacles. Flood to 2015. Newly discovered key Biblical events previously overlooked! Did you know that the very first tetrad occurred about the time of Noah's Flood? A special Hanukkah-tetrad exactly at 168 BC. "The abomination that causes desolation"
They follow the theme of Joseph's dream of 'the sun and moon bowing down to him', Gen.37:9;43:26, and 'to Judah', Gen.49:8. 'Blood-moon eclipses' symbolize this humbling, and the blood speaks of suffering, (Isa. 13:10). Behold, the bowing and rising of Israel! 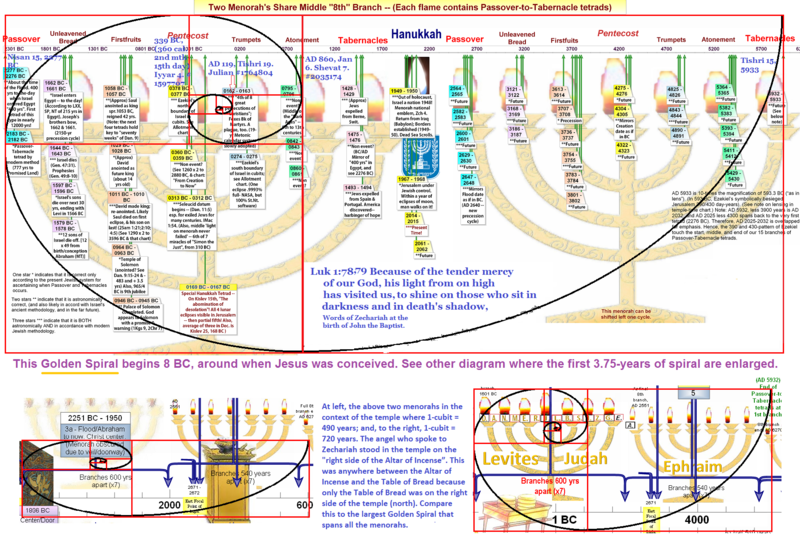 Below chart contains all Passover-Tabernacles tetrads, including distant past and future. 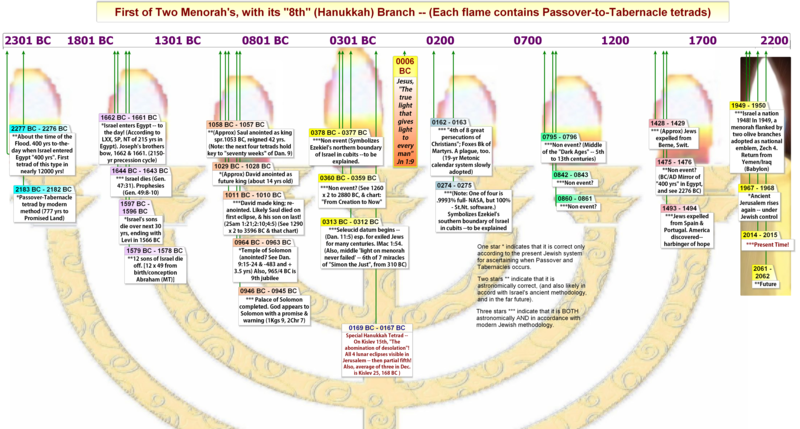 Notice that we are currently in the exact middle of a massive 8000-year cycle, which takes the shape of two menorahs! The image below is the same as above, except it zeros in and greatly enlarges the beginning of the above Phi Spiral as it spreads out at the time of the conception of Jesus. The greatest lesson learned from these lunar-eclipse tetrad cycles, is that they bring out God's great plan over vast spans of time -- past and future. They reveal "The Temple of Time". Click for much more about "Blood-Moon Prophecy four Israel!" Blood-Moon (Blog 1260d.com) Names Code Bible-Codes 360-cal 1260-site Saved? Copyright © 1997-2017. If reproduced, please provide hyperlink back to this page.